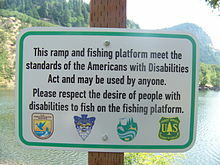 The Americans with Disabilities Act (the ADA) is a law that was passed by the United States Congress in 1990. 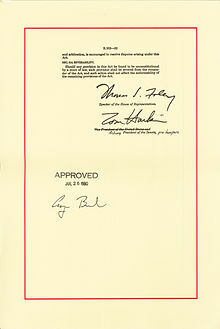 President George H. W. Bush signed the ADA, making it an official United States law, on July 26, 1990. Later, President George W. Bush amended (changed) the ADA and signed those changes into law. The changes started on January 1, 2009. The ADA is a detailed civil rights law whose goal is to protect people with disabilities from discrimination. Before the ADA, people with disabilities did not have many legal protections. In 1964, the Civil Rights Act of 1964 was passed. This law made it illegal to discriminate against people because of their race, religion, gender, national origin (home country), and many other things. But people with disabilities were not included or protected under the Civil Rights Act of 1964. The ADA gave the Civil Rights Act's protections - and some others - to people with disabilities. 1 Who Is Protected Under the ADA? 2 Who Is Not Protected Under the ADA? 3.1.1 What Employers are Covered by the ADA? 3.1.2 What Do Employers Have to Do? 3.1.3 What is Employment Discrimination? 3.2.1 What Do State and Local Governments Have to Do? 3.3.1 Who Is Covered by Title III? 3.3.2 What Do Public Accommodations Have to Do? 3.4.1 Who Is Covered by Title IV? 3.4.2 What Do Telecommunications Companies Have to Do? The ADA protects people with disabilities. The ADA says that a disability is a physical or mental problem that makes it very difficult to do at least one "major life activity." Major life activities are things like walking, breathing, learning, reading, communicating, seeing, hearing, thinking, and other very important tasks. The ADA lists some conditions that are not counted as disabilities. People with these conditions are not protected by the ADA. The goal of not including these people was to make sure the ADA's goal of protecting people with disabilities was not abused. The ADA has five sections, which are called titles. Each title protects against a different kind of discrimination. The titles are numbered in Roman numerals: I (one), II (two), III (three), IV (four), and V (five). Title I of the ADA protects against discrimination in employment (work). Not every employer has to follow the ADA's rules. Employers that are covered by the ADA, and have to follow the ADA's rules, are called "covered entities." Title I says that employers who are covered by the ADA cannot discriminate against a person with a disability, as long as that person is qualified (able) to do their job. Title I does not say that people with disabilities have to be hired for jobs that they are not qualified for. These employers do have to give "reasonable accommodations" to workers with disabilities if needed. An "accommodation" is a change in the way things are usually done. It is a change that a worker needs because of a disability, to help them do their job. If a worker with a disability needs reasonable accommodations to do their job, that does not mean they are not qualified to do their job. As long as the worker is able to do their job with the help of accommodations, they are qualified to do the job. However, the accommodation must be "reasonable." An accommodation is not reasonable if it would be very difficult or very expensive. If an accommodation is not reasonable, the employer does not have to give it. Usually, employers cannot ask workers or people applying for jobs whether they have a disability, or ask them to give details about their disability. If a person with a disability thinks their employer has discriminated against them, they can make a complaint to the U.S. Equal Employment Opportunity Commission (EEOC). The complaint has to be made within 180 days of when the discrimination happened. If the EEOC thinks discrimination has happened, they will send a letter that tells the person with the disability that they have the right to sue (file a lawsuit against) their employer. 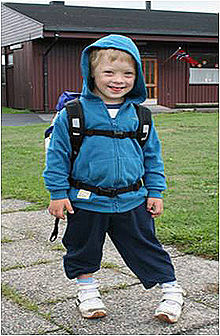 The person with the disability may then file a lawsuit in federal court. Title II protects against discrimination in all activities of state and local governments. State and local governments have to give people with disabilities the same chances as people without disabilities to use all of their programs and services. If people with disabilities need reasonable accommodations to be able to participate in these programs, the state or local government has to make them. A special part of Title II covers public transportation. It protects people with disabilities from being discriminated against by public transportation. This includes city buses, subways, commuter trains, Amtrak, and all other transportation that the public can use. Wherever there is a bus or train line that runs on a fixed route (it cannot make special stops), the government must provide paratransit. Paratransit is a service for people with disabilities who cannot use the regular public transportation system. Paratransit (usually a car or bus) picks them up and drops them off where they need to go. The complaint might be sent to a mediation program. The person with a disability, someone from the state or local government, and a mediator will all meet together. The mediator's job is to help everyone come up with a solution that everyone can agree to. A person with a disability can also file their own lawsuit in a federal court, saying that the state or local government discriminated against them. The person does not need to complain to the Department of Justice first, or have the Department of Justice tell them they have the right to sue. When a new building is built, the new buildings have to be accessible. If a building is being "altered" (changed), the changes have to make things accessible, if possible. (For example, if a doorway is being moved, the new doorway must be wide enough for a wheelchair to get through.) But public accommodations do not have to make their changes accessible if that would add more than 20% to the cost of making the change. When building or changing swimming pools, wading pools, and spas, they have to make an accessible way for people with disabilities to get in and out. Make sure people with disabilities can buy and do things in the same places people without disabilities can. Get rid of rules that make it impossible for people with disabilities to buy and do things in public accommodations. Have special tools to communicate with people with disabilities (like a special phone for talking with people who are deaf or have trouble hearing). The complaint might be sent to a mediation program. The person with a disability, someone from the public accommodation, and a mediator will all meet together. The mediator's job is to help everyone come up with a solution that everyone can agree to. The Department of Justice may bring a lawsuit against the public accommodation. If a person is unable to write, fax, or type a complaint because of a disability, the Department of Justice will make reasonable accommodations to help. The person can call the Department of Justice's ADA Information Line. The Information Line is answered by ADA Specialists. A person with a disability can explain their complaint, and the Specialist will write it down for them. If the person is deaf and uses American Sign Language, a Specialist can take their complaint by videophone (so they can see each other and sign back and forth to each other). A person can also file their own lawsuit against the public accommodation, without needing the Department of Justice to say they have a "right to sue." Title IV of the ADA protects against discrimination by telecommunications companies in the U.S. (like phone companies). Title IV protects any person with a disability, but it focuses on people with speaking and hearing disabilities, because they have the most trouble talking by phone. Create relay services. A relay service is a way for a telephone operator to help a person with a speaking or hearing disability to call a regular phone. To do this, the person with the disability uses a keyboard or some other special tool. Make their relay services available 24 hours a day, 7 days a week. Not charge people with disabilities any more than they charge people without disabilities. A deaf person at work communicating with a hearing person by using a Video Relay Service. She uses Sign Language, which the operator translates out loud for the hearing person. Relay services have changed a lot since 1990. At first, the most common relay services were teletypewriter (TTY) and Telecommunications for the Deaf (TDD) devices. These were like phones with typewriters attached. Two people with TDDs could type back and forth to each other. Or, if a person with a disability wanted to call a regular phone (like a pizza restaurant), they could type into the phone, an operator would read the message out loud to the pizza restaurant, listen to the restaurant's answer and type it back to the person with a disability. Title IV also led every state in the U.S. to create Telecommunications Relay Services (TRS), such as STS relay. STS stands for Speech-to-Speech. It was created for people who have speaking problems. STS relay operators listen to what the person is saying and repeats it in a clear voice to make it easier for the other person to understand. Today, many calls that use TRS are made over the Internet by consumers who use broadband connections. Some are Video Relay Service (VRS) calls, while others are text calls. Either way, communication assistants translate between the signed or typed words of a consumer and the spoken words of others. In 2006, according to the Federal Communications Commission (FCC), VRS calls averaged two million minutes a month. Complaints about discrimination under Title IV go to the Federal Communications Commission (FCC). Nothing in the ADA changes or cancels anything in Section 504 of the Rehabilitation Act. Section 504 was the first law to give any civil rights to people with disabilities. ↑ "President Bush Signs ADA Changes into Law". HR.BLR.com. 2008-09-25. ↑ From the George H.W. Bush Presidential Records of the George Bush Presidential Library. Folder Title: Fact Sheet on ADA [Americans of Disabilities Act]. Unrestricted. ↑ 5.0 5.1 "National Archives and Records Administration". ↑ 6.0 6.1 EEOC. 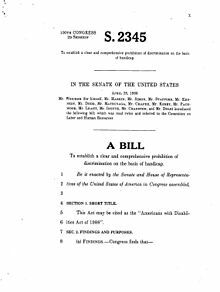 "The ADA Amendments Act of 2008: Frequently Asked Questions". dol.gov. U.S. Department of Labor. Retrieved December 8, 2015. ↑ Civil Rights Division, US Department of Justice (2009). "42 U.S. Code § 12102 - Definition of disability, Americans with Disabilities Act of 1990, As Amended". ada.gov. ↑ EEOC (2008). "Americans with Disabilities Act Amendments Act of 2008, PL 110-325 (S 3406)". eeoc.gov. ↑ 12.0 12.1 EEOC. "EEOC Enforcement Guidance: Reasonable Accommodation and Undue Hardship Under the Americans with Disabilities Act". EEOC.gov. ↑ EEOC. "Enforcement Guidance: Preemployment Disability-Related Questions and Medical Examinations". EEOC.gov. ↑ EEOC. "EEOC Enforcement Guidance: Disability-Related Inquiries and Medical Examinations of Employees Under the Americans with Disabilities Act". EEOC.gov. ↑ U.S. Equal Employment Opportunity Commission. "Filing a Formal Complaint". EEOC.gov. Retrieved December 9, 2015. ↑ "2013 ADA Pool Lift Compliance Deadline: Has Your Business Complied?". The National Law Review. Lowndes, Drosdick, Doster, Kantor & Reed, P.A. 2013-01-29. Retrieved 2013-02-19. ↑ 21.0 21.1 21.2 United States Federal Communications Commission. 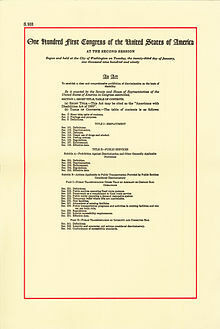 "Title IV of the ADA". FCC.gov. Retrieved December 13, 2015. ↑ United States Federal Communications Commission. "Accessibility Complaint Filing Categories". FCC.gov. Retrieved December 13, 2015. This page was last changed on 18 April 2019, at 22:30.